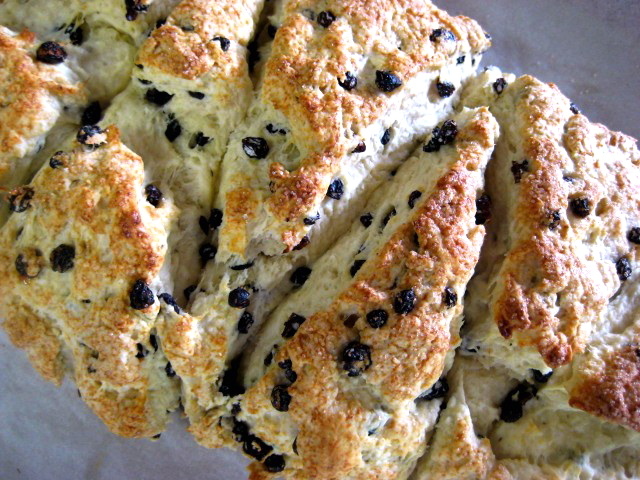 Light, buttery and studded with Zante currants, mom's scones weren't the dry, heavy sugar bombs you find these days at Starbucks. I've encountered scones like hers only once: at afternoon tea on The Veranda at the Moana Surfrider Waikiki. I enjoyed them so much, the hotel sent me home with a little box of them (but not the recipe). I don't have my mom's recipe, either, but with some experimentation I've come up with a close approximation. They're not quite the same, but if I put on some reggae, I can almost imagine she's here with me. As with any scone or biscuit, the key here is to use a very light touch. Mix the ingredients and handle the dough as little as possible. 1. Heat oven to 375 degrees F and line a baking sheet with parchment. 2. In a medium bowl, whisk together the flour, 2 tablespoons sugar, salt and baking powder. Add the currants and toss to coat with the flour mixture. Rub in the cold butter with your fingertips, working quickly so as not to warm the butter. The mixture should resemble very coarse cornmeal with large pea sized lumps of butter throughout. Add the milk all at once and gently stir until the dough just begins to come together. Turn it a few times in the bowl to pick up the dry flour bits at the bottom. 3. 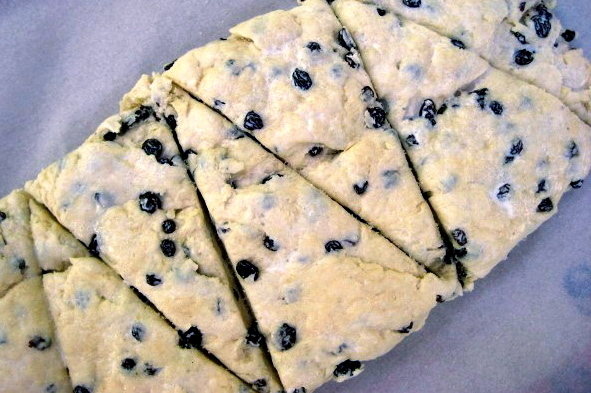 Transfer the dough to the prepared baking sheet and quickly shape it into a rectangle about 1 1/4 inch thick. Cut the rectangle on the diagonal to form 8 wedges (see below). Brush with half and half or whisked egg yolk, and sprinkle with sugar. 4. Bake for 18-25 minutes, rotating pan halfway through, until scones are golden brown on top and sound hollow when tapped. Cool on a rack for 5 minutes, break into wedges, and serve with butter and jam. 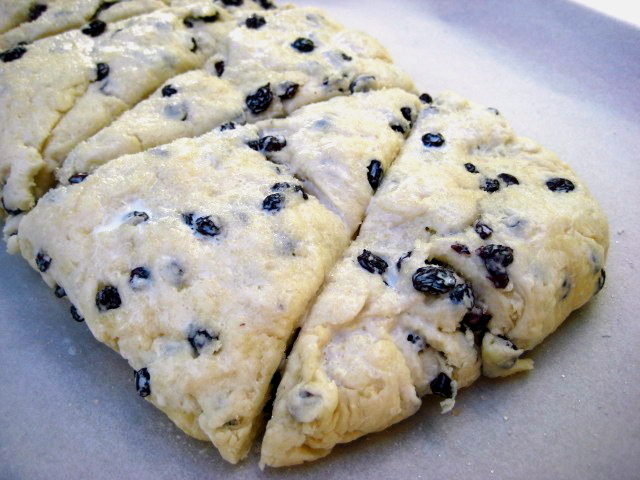 Scones are best served warm, on the day they're made. However, I've had success freezing and then reheating them in a 350 degree F oven. 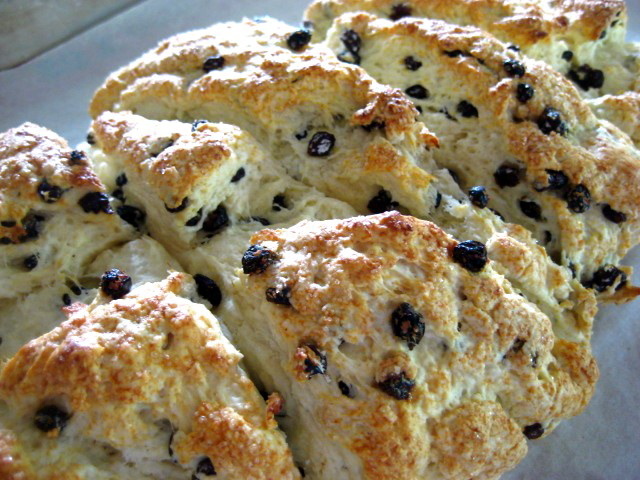 Scones and reggae on a sunday morning-what a wonderful memory to have, it sounds lovely. Your scones look delicious, I love their rustic, craggy tops. PERFECT! My mom used to make something VERY similar. I have been looking for such a recipe to make one morning for my girls! Thank you for this post. I will be making these this weekend! Just made the scones! Wish people would comment after the make something from a recipe as well. Love them. Used to make them with cream and more butter. Making them this way, i can put butter and/or jam on them. I did cut down on the baking powder. 2T instead of 3T. Next time, I might even try a little less. Find that sometimes one can taste the baking powder! Thank you again for a nice recipe!